This delicious and easy to prepare roast can be enjoyed warm on Christmas Day, while leftovers make a great cold cut to be served for supper or throughout Boxing Day. Pork is known to go well with sweet condiments such as apples, plums or cabbage, and the prune and walnut combination does not disappoint. Indeed, the stuffing, marjoram crackling and roasted onion gravy bring a festive feel to the dish (many cultures drink a dried fruit compote or spiced wine at Christmas and this dish has definitely got those flavour notes through it). 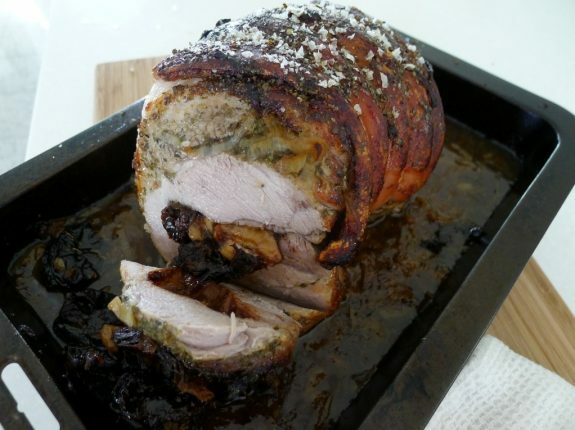 Both rolled pork leg and loin can be used for this dish, and cooking method varies only based on the size of your uncooked piece of meat – see notes below. Note: Generally when cooking boneless pork roast you should cook the meat for 25 minutes at 220C, then at 180C for 20-30 minutes per each 0.5kg of meat. Skin off and lean cuts will be closer to the 20 minute mark, while skin on fattier pieces closer to 30 minutes per 0.5kg. Place prunes, walnuts (and brandy) in a bowl and mix, checking there are no pits. Using a sharp knife make a long slit pocket running inside the middle of the meat. Stuff the prune mixture in, ensuring it is well packed in. Some of this mixture will flow out during cooking and this will enrich the onion gravy. Mix 2 tbsps oil, marjoram, salt and pepper in a bowl. Rub mixture all over the meat. Heat a little oil in a frypan and brown the meat high heat on all sides to seal – however, if you’re using a skin on cut, do not brown the skin! Place onion and any remaining oil in a small roasting tin. Pop the meat on top and roast on the top rack at 220C for 30 minutes to get the crackling going, then move to middle shelf and roast for a further 75 minutes at 180C (for loin only, baste occasionally with pan juices). Turn oven off and allow the meat to rest for another 15 minutes. Serve warm with rice or bread and lashings of gravy. Make sure to use all the crackling during the first serving as that’s when it is at its best. For salads, try the red cabbage and mint slaw. Cold cut note: If you haven’t already, remove the crackling and fatty layer underneath. Slice thinly and serve as part of your cold meet platter with remaining pan juice ‘jam’. Store whole piece in the fridge wrapped in aluminum foil then serve as needed. I’ve just caught up on your posts! phew, a lot of delicious cooking has been going on in your household 🙂 this looks particularly delicious. I love the flavour additions here – walnuts and prunes, so yummy. I cannot wait for Christmas eats this weekend, and this post has made me even more excited! Love this! Have prunes, will pork!! !